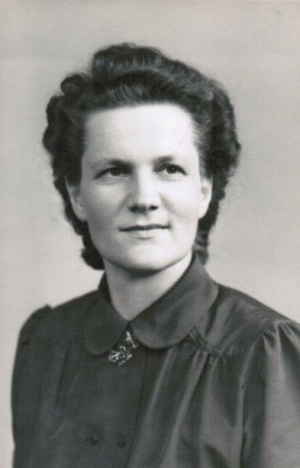 Hulda Martens Lindenbach: missionary, Christian worker; born 12 March 1915 at Main Centre, Saskatchewan, Canada to Jacob A. Martens (4 December 1880, Yazykovo Mennonite Settlement, South Russia - 28 January 1962, Clearbrook, British Columbia, Canada) and Anna (Redekop) Martens (14 August 1880, Neuendorf, Chortitza Mennonite Settlement, South Russia - 22 March 1966, Clearbrook, British Columbia). Hulda was the eighth of twelve children, two of which died in infancy. On 19 September 1981 Hulda married William F. "Bill" Lindenbach (27 December 1905 - 18 October 1990) in Three Hills, Alberta, Canada. Hulda Martens Lindenbach died 7 September 2006 in Three Hills. With the help of her public school teacher, Hulda was led to faith in Christ. That experience at the age of 14 years motivated her to be active in soul-winning the rest of her life. She was baptized and joined the Main Centre Mennonite Brethren Church, where her father was a lay leader. Hulda attended Herbert Bible School in Herbert, Saskatchewan from 1938 to 1940. After two further years of study at Prairie Bible Institute at Three Hills, Alberta, she graduated in 1942. Prairie’s strong emphasis on involvement in pioneer missions helped Hulda clarify her calling to be a missionary to Africa. Additional training included medical training for missionaries and studies at the Summer Institute of Linguistics (SIL), then a relatively new organization begun by William Cameron Townsend in 1934, in Arkansas, USA. During summer months Hulda was involved in Daily Vacation Bible School where she took delight in leading children and parents to faith in Christ. While at Prairie she became acquainted with Worldwide Evangelism Crusade (WEC), a missionary agency begun by C. T. Studd of England in 1913. Hulda was accepted by this interdenominational mission society to serve in the Belgian Congo, now called the Democratic Republic of Congo. She spent two-seven year terms with WEC as a teacher, beginning in 1945. Due to the rebellion in 1960 expatriates’ lives were in danger. Consequently, Hulda together with the other missionaries was evacuated. Shortly after returning home Hulda took a three month course with Child Evangelism Fellowship (CEF) in Grand Rapids, Michigan, a ministry which now operates in more than 160 countries. From 1960 to 1970 Hulda was full-time director of CEF for Vancouver and the Fraser Valley, British Columbia, Canada. During the years of 1970 to 1979 she served at the WEC headquarters in Ontario, Canada and Pennsylvania, USA. After retiring in Three Hills, Hulda served as a volunteer at the Prairie Bible Institute Book Room. She married Bill Lindenbach in 1981. The couple lived in Kelowna, British Columbia for a few years until Bill’s death in 1990. Hulda returned to Three Hills. A quote in her last form letter was representative of Hulda’s mission in life. "A charge to keep have I; a God to glorify." GRANDMA (The Genealogical Registry and Database of Mennonite Ancestry) Database, 6.05 ed. Fresno, CA: California Mennonite Historical Society, 2010: #9097. Defehr, Eldon. "Lindenbach, Hulda Martens (1915-2006)." Global Anabaptist Mennonite Encyclopedia Online. December 2010. Web. 19 Apr 2019. http://gameo.org/index.php?title=Lindenbach,_Hulda_Martens_(1915-2006)&oldid=123756. Defehr, Eldon. (December 2010). Lindenbach, Hulda Martens (1915-2006). Global Anabaptist Mennonite Encyclopedia Online. Retrieved 19 April 2019, from http://gameo.org/index.php?title=Lindenbach,_Hulda_Martens_(1915-2006)&oldid=123756. This page was last modified on 31 July 2014, at 05:35.